Schematic of Intelligent Cruise Control. The red car automatically maintains a safe distance from the blue car. Adaptive cruise control by the Insurance Institute for Highway Safety example video. Control is based on sensor information from on-board sensors. Such systems may use a radar or laser sensor or a camera setup allowing the vehicle to brake when it detects the car is approaching another vehicle ahead, then accelerate when traffic allows it to. ACC technology is widely regarded as a key component of any future generations of intelligent cars. They impact driver safety and convenience as well as increasing capacity of roads by maintaining optimal separation between vehicles and reducing driver errors. Vehicles with autonomous cruise control are considered a Level 1 autonomous car, as defined by SAE International. When combined with another driver assist feature such lane centering then the vehicle is considered a Level 2 autonomous car. Adaptive cruise control does not provide full autonomy: the system only provides some help to the driver, but does not drive the car by itself. 1992: Mitsubishi was the first to offer a lidar-based distance detection system on the Japanese market called Debonair. Marketed as "distance warning", this system warns the driver, without influencing throttle, brakes, or gearshifting. 1995: Mitsubishi Diamante introduced laser "Preview Distance Control". This system controlled speed through throttle control and downshifting, not by applying the brakes. 1997: Toyota offered a "laser adaptive cruise control" (lidar) system on the Japanese market Celsior. It controlled speed through throttle control and downshifting, not by applying the brakes. 1999: Mercedes introduced "Distronic", the first radar-assisted ACC, on the Mercedes-Benz S-Class (W220) and the CL-Class. 1999: Jaguar began offering a radar-based ACC system on the Jaguar XK (X100). 1999: Nissan introduced laser ACC on the Japanese market Nissan Cima. 1999: Subaru introduced world's first camera-based ACC on the Japanese-market Subaru Legacy Lancaster. 2000: BMW introduced radar "Active Cruise Control" in Europe on the BMW 7 Series - E38. 2000: Toyota was the first to bring laser ACC to the US market in late 2000, with the LS 430 Dynamic Laser Cruise Control system. 2000: Toyota's laser ACC system added "brake control", that also applies brakes. 2001: Infiniti introduced laser "Intelligent Cruise Control" on the 2002 Infiniti Q45 Third generation F50 and 2002 Infiniti QX4. 2002: Volkswagen introduced radar ACC, manufactured by Autocruise (now TRW), on the Volkswagen Phaeton. 2003: Cadillac introduced radar ACC on the Cadillac XLR. 2003: Toyota shifted from laser to radar ACC on the Celsior. The first Lexus Dynamic Radar Cruise Control and a radar-guided pre-collision system appeared on the Lexus LS(XF30) US market facelift. 2004: Toyota added "low-speed tracking mode" to the radar ACC on the Crown Majesta. The low-speed speed tracking mode was a second mode that would warn the driver and provide braking if the car ahead stopped; it could stop the car, but would then deactivate. 2005: In the United States, Acura introduced radar ACC integrated with a Collision avoidance system (Collision Mitigation Braking System (CMBS)) in the model year 2006 Acura RL. 2005: Mercedes-Benz S-Class (W221) upgraded ACC to completely halt the car if necessary (now called "Distronic Plus" on E-Class and most Mercedes sedans. 2006: Volkswagen Passat B6 introduced radar ACC supplied by Autocruise and TRW, functioning from 30 to 210 km/h. It supported additional function AWV1 and AWV2 to prevent collision, by using the brake system. 2006: Audi introduced full speed range ACC plus on the Audi Q7. In low-speed mode, it warns the driver of a potential collision and prepares emergency braking as needed. The system was supplied by Bosch. 2006: Nissan introduced "Intelligent Cruise Control with Distance Control Assist" on Nissan Fuga. It pushes the gas pedal against the foot when the navigation system observes an unsafe speed. If the Autonomous cruise control system is used, the Distance Control Assistance reduced speed automatically, and warned the driver that with an audible bell sound. 2006: September 2006 Toyota introduced its "all-speed tracking function" for the Lexus LS 460. The radar-assisted system maintained continuous control from speeds from 0 km/h to 100 km/h and is designed to work under stop/go situations such as highway traffic congestion. 2007: BMW introduced full-speed Active Cruise Control Stop-and-Go on the BMW 5 Series (E60). 2008: Lincoln introduced radar ACC on the 2009 Lincoln MKS. 2008: Volkswagen Passat CC, B6 and Touareg GP. The ACC system updated to support a full auto stop and added Front Assist function to prevent collision working separately of ACC. Front Assist cannot brake automatically, it only increases the pressure in the brake system and warns the driver. 2008: Volkswagen Golf 6 introduced ACC with lidar. 2009: Hyundai introduced radar ACC on Hyundai Equus in Korean market. 2009: ACC and CMBS also became available as optional features in the model year the 2010 Acura MDX Mid Model Change (MMC) and the newly introduced model year 2010 Acura ZDX. 2010: Volkswagen Passat B7, CC. Update of ACC and updated Front Assist. Introduced emergency braking, named "City". Car could brake automatically to prevent collision. 2013: BMW introduced Active Cruise Control with Traffic Jam Assistant. 2014: Chrysler introduced full speed range radar "Adaptive Cruise Control with Stop+" on the 2015 Chrysler 200. 2014: Tesla introduced autopilot feature to Model S cars, enabling semi-autonomous cruise control. 2015: Ford introduced first pickup truck with ACC on the 2015 Ford F150. 2015: Honda introduced its European CR-V 2015 with predictive cruise control. Laser-based systems do not detect and track vehicles in adverse weather conditions nor do they reliably track dirty (and therefore non-reflective) vehicles. 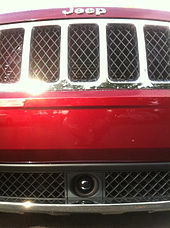 Laser-based sensors must be exposed, the sensor (a fairly large black box) is typically found in the lower grille, offset to one side. Radar-based sensors can be hidden behind plastic fascias; however, the fascias may look different from a vehicle without the feature. For example, Mercedes-Benz packages the radar behind the upper grille in the center and behind a solid plastic panel that has painted slats to simulate the look of the rest of the grille. Single radar systems are the most common. Systems involving multiple sensors use either two similar hardware sensors like the 2010 Audi A8 or the 2010 Volkswagen Touareg, or one central long range radar coupled with two short radar sensors placed on the corners of the vehicle like the BMW 5 and 6 series. A more recent development is the binocular computer vision system, such as that introduced to the US market in model year 2013 by Subaru. These systems have front-facing video cameras mounted on either side of the rear view mirror and use digital processing to extract depth information from the parallax between the two cameras' views. Radar-based ACC often feature a precrash system, which warns the driver and/or provides brake support if there is a high risk of a collision. Also in certain cars it is incorporated with a lane maintaining system which provides a power steering assist to reduce steering input burden on corners when the cruise control system is activated. Systems with multiple sensors can practice sensor fusion to integrate the data from to improve safety and/or driving experience. GPS data can inform the system of geographic features such as a freeway offramp. A camera system could notice driver behavior such as brake lights and/or a turn signal. This could allow a following car to interpret a turn signal by an exit as not requiring the following car to slow down, as the leading car will exit. Multi-sensor systems could also take note of traffic signs/signals and not, e.g., violate a red light while following a vehicle that crossed before the signal changed. Predict systems modify speed based on predictions of other vehicles' behavior. Such systems can make earlier, more moderate adjustments to the predicted behavior, improving safety and passenger comfort. One example is to predict the likelihood of a vehicle in a neighbouring lane moving in front of the controlled vehicle. One system predicts a lane change up to five seconds before it occurs. Vehicles with Full Speed Range 0MPH are able to bring the car to a full stop to 0 mph and need to be re-activated to continue moving with something like a tap of the gas pedal. Vehicles with Traffic Jam Assist / Stop & Go auto resume from standstill to creep with stop and go traffic. Vehicles with Partial cruise control cuts off & turns off below a set minimum speed, requiring driver intervention. Vehicles with fully automated speed control can respond to traffic signals and non-vehicular on-road activity. Any Vehicle 1990+ Uses OpenCV with no braking. 5-series (2007+), 7-series (2009+), X5 (2011+) excl Diesel, 3-series (2013+), i3 (2014+), X3 (2014+) Active Cruise Control with Stop & Go Series 7, 5, 6, 3 (2000+), Mini (2014+) Stop & Go/Lane Assist controls steering for up to 30 seconds of hands-off driving. Highway driving only. Available on 3, 5, 6 and 7 models. Panamera (2010+); Cayenne (2011+), Cayman (2013+), Boxster(2012+) Porsche Active Safe (PAS), PDK transmission only. ACC also includes automatic braking. Newest models feature full power auto-brake with pedestrian and cyclist detection. In 1999, Mercedes introduced Distronic, the first radar-assisted adaptive system, on the Mercedes-Benz S-Class (W220) and the CL-Class. Distronic adjusts the vehicle speed automatically to the car in front in order to always maintain a safe distance to other cars on the road. Mercedes-Benz S 450 4MATIC Coupe. The forward-facing Distronic sensors are usually placed behind the Mercedes-Benz logo and front grille. In 2005, Mercedes refined the system ("Distronic Plus") making the Mercedes-Benz S-Class (W221) the first car to receive the upgraded system. Distronic Plus could now completely halt the car if necessary on most sedans. In an episode of Top Gear, Jeremy Clarkson demonstrated the effectiveness of the system by coming to a complete halt from motorway speeds to a round-about and getting out, without touching the pedals. In 2016, Mercedes introduced Active Brake Assist 4, the first emergency braking assistant with pedestrian recognition. One crash caused by Distronic Plus dates to 2005, when German news magazine "Stern" was testing Mercedes' original Distronic system. During the test, the system did not always manage to brake in time. Ulrich Mellinghoff, then Head of Safety, NVH, and Testing at the Mercedes-Benz Technology Centre, stated that some tests failed because the vehicle was tested in a metallic hall, which caused problems with radar. Later iterations received an upgraded radar and other sensors, which are not disrupted by a metallic environment. In 2008, Mercedes conducted a study comparing the crash rates of Distronic Plus vehicles and vehicles without it, and concluded that those equipped with Distronic Plus have an around 20% lower crash rate. ^ "A Safety Feature By Any Other Name Can Really Be Confusing, AAA Finds". NPR.org. Retrieved 25 January 2019. ^ "Path to Autonomy: Self-Driving Car Levels 0 to 5 Explained". Car and Driver. ^ "Here is everything you need to know about adaptive cruise control". digitaltrends.com. 25 September 2017. ^ a b Pratyush Bhatia. "Vehicle Technologies to Improve Performance and Safety" (PDF). Archived from the original (PDF) on 11 October 2003. Retrieved 2015-12-30. ^ "Company History". Mitsubishi Motors. Archived from the original on 30 December 2014. Retrieved 30 December 2014. ^ "Press Release - Mitsubishi Motors Corporation". mitsubishi-motors.com (Press release). Retrieved 14 January 2017. ^ a b c d e "Technical Development - Electronics Parts". toyota-global.com. Retrieved 6 April 2015. ^ a b "Mercedes-Benz S-Class, W 220 series (1998 to 2005)" (Press release). ^ "Innovation as a tradition". 27 November 2014. Archived from the original on 29 December 2014. ^ a b "Technical highlights of the CL-Class and its predecessor series" (Press release). ^ "Jaguar Teams with Delphi to Introduce Adaptive Cruise Control". www.prnewswire.com (Press release). ^ "Nissan - Nissan Research Center - On the Research Front Lines - Hideaki Inoue". www.nissan-global.com. Archived from the original on 30 December 2014. Retrieved 30 December 2014. ^ Fahrwerkhandbuch. Springer-Verlag. p. 639. ISBN 9783658019921. Retrieved 13 May 2017. ^ "Finally! Adaptive Cruise Control Arrives in the USA". Ivsource.net. 29 September 2000. Archived from the original on 8 September 2008. Retrieved 12 October 2011. ^ "First drive: Renault gets Vel Satis-faction". 27 September 2002. Archived from the original on 30 December 2014. Retrieved 2015-01-19. ^ "Premiere auf dem Automobilsalon in Genf: Renault Vel Satis mit neuer Wischertechnik von Bosch". Robert Bosch. 9 March 2001. Archived from the original on 30 December 2014. Retrieved 19 January 2015. ^ "Launch of top-of-the-range Lancia Thesis is delayed further". Automotive News Europe. 24 September 2011. Retrieved 19 January 2015. ^ Corp., Delphi. "Delphi's Adaptive Cruise Control Technology Featured On Cadillac XLR". www.prnewswire.com. ^ "430: Luxury or 'ultra luxury'". ^ "Low Speed ACC Finally Hits the Market". Ivsource.net. Retrieved 12 October 2011. ^ "2006 Acura RL – Safety" (Press release). Hondanews.com. 17 August 2005. Retrieved 12 October 2011. ^ "Distance Control: DCX and VW Offering Adaptive Cruise Control System with a Low-Speed Mode". Marklines. 7 April 2006. Archived from the original on 30 December 2014. Retrieved 2015-12-30. ^ "Nissan - news cite press release". www.nissan-global.com (Press release). Archived from the original on 27 October 2011. Retrieved 30 December 2014. ^ Interone Worldwide GmbH (17 June 2008). "Active Cruise Control with Stop & Go function on the BMW 5 Series Sedan". Bmw.com. Retrieved 12 October 2011. ^ "Ssangyong Motor". www.smotor.com (Press release). ^ "New 2010 Acura ZDX Four-Door Sports Coupe Delivers Style, Performance, Luxury and Refinement" (Press release). Hondanews.com. 17 August 2009. Archived from the original on 14 December 2009. Retrieved 2011-10-12. ^ a b "The new Audi A8 – The sportiest sedan in the luxury class". Archived from the original on 31 December 2014. Retrieved 30 December 2014. ^ Chrysler Group (2 June 2010). "All-new 2011 Jeep Grand Cherokee Earns 'Top Safety Pick' From the Insurance". prnewswire.com (Press release). Retrieved 6 April 2015. ^ "New assistance systems: The helpers in the background" (Press release). ^ "BMW – Sheer Driving Pleasure". www.bmw.com. ^ "Riding shotgun in Tesla's fastest car ever". Engadget. Retrieved 10 October 2014. ^ "Tesla D is, as expected, an AWD Model S but new autopilot features surprise". AutoblogGreen. Retrieved 10 October 2014. ^ White, Joseph B. (10 October 2014). "Tesla Aims to Leapfrog Rivals". The Wall Street Journal. Retrieved 21 March 2015. ^ a b Ramsey, Jonathon (4 January 2015). "New Honda smart cruise control predicts other motorists' future idiocy". Autoblog. Retrieved 26 February 2017. ^ Bloch, Alexander (18 January 2010). "Die Technik-Highlights des neuen Audi A8" (in German). Auto-motor-und-sport.de. Retrieved 12 October 2011. ^ Bloch, Alexander (9 February 2011). "Assistenzsysteme im Test: Sechs Modelle im Sicherheitsvergleich" (in German). Auto-motor-und-sport.de. Retrieved 12 October 2011. ^ Bloch, Alexander (8 January 2010). "Abstandsregeltempomaten im Test: Mittelklasse-Autos" (in German). Auto-motor-und-sport.de. Retrieved 12 October 2011. ^ An Android App For Cruise Control Accessed 3 November 2011. ^ "2016 Acura ILX Owner's Manual" (PDF). Archived from the original (PDF) on 18 January 2016. ^ "2017 RDX User Manual" (PDF). p. 54. Retrieved 2 December 2016. ^ "Alfa Romeo Feature Availability" (PDF). ^ "The new Audi A8". Retrieved 17 February 2010. ^ USA News Accessed 6 September 2013. ^ McKeegan, Noel (6 March 2017). "Towards autonomy: Driving the new BMW 5 Series". newatlas.com. Retrieved 9 March 2017. ^ IIHS Accessed 16 September 2016. ^ Chrysler - Build & Price Accessed 9 September 2014. ^ "Compare Models". ford.com.au. Retrieved 14 January 2017. ^ "10 Awesome Driver-Assist Features That Help 2015 Ford F-150 Customers Drive Smarter - Ford Media Center". ford.com. Retrieved 14 January 2017. ^ a b "Ford Media Release:Adaptive Cruise Control and Collision Warning with Brake Support" (PDF). Archived from the original (PDF) on 14 October 2013. Retrieved 19 July 2012. ^ "Which cars have self driving features for 2018". cars.com. Retrieved 25 July 2018. ^ "Honda Cars - Sensing Technology - Official Site". honda.com. Retrieved 14 January 2017. ^ "Honda Sensing - Official Site". honda.com. Retrieved 10 September 2015. ^ "2014 Jeep Cherokee Owner's Manual" (PDF). ^ "2011 Jeep Grand Cherokee Owners Manual" (PDF). Retrieved 7 April 2013. ^ "ALL-NEW LINCOLN CONTINENTAL DELIVERS QUIET LUXURY: ELEGANT, SERENE, EFFORTLESSLY POWERFUL". ^ "QUIET LUXURY: INTUITIVE TECHNOLOGY, EFFORTLESS PERFORMANCE AND DISTINCTIVE DESIGN DRIVE 2017 LINCOLN MKZ". ^ "2017 Mazda CX-5 first drive review: Will more tech, quieter cockpit match Audi, BMW?". extremetech.com. Retrieved 24 November 2017. ^ "[MAZDA]MRCC - Active Safety Technology". mazda.com. Retrieved 6 April 2015. ^ "New SEAT Ateca – Car Safety | SEAT". www.seat.com. Retrieved 6 October 2016. ^ "2013 Subaru Legacy and Outback" (PDF). subaru.com. Retrieved 6 April 2012. ^ "Tesla Firmware 6.1 Update Introduces Traffic-Aware Cruise Control for Autopilot". autoevolution.com. Retrieved 13 January 2015. ^ "The New Hotness: 2018 C-HR Ushers in an Exciting Chapter of Toyota Style, Versatility, and Performance | Toyota". Retrieved 1 December 2016. ^ "Toyota Introduces New 10th-Generation Corolla in Japan". Automobile.com. Retrieved 12 October 2011. ^ "Toyota Safety Sense (TSS) Applicability Chart" (PDF). Retrieved 26 April 2017. ^ "Prius v brochure" (PDF). ^ "2016 RAV4 Brochure" (PDF). ^ "09 Dynamic Laser Cruise Control Release - Toyota" Accessed 7 September 2013. ^ "Volvo S60 Adaptive Cruise Control". Volvo.com. Archived from the original on 18 November 2011. Retrieved 13 November 2011. ^ Daimler AG (2016). "Mercedes-Benz Trucks: Safety: New assistance systems: Active Brake Assist 4 emergency: braking assistant featuring pedestrian recognition and: Sideguard Assist". media.daimler.com (Press release). Retrieved 11 July 2017. ^ a b "Mercedes S-Klasse: Panne bei Crash-Test". Stern (in German). 16 November 2005. Retrieved 11 July 2017. ^ "Pedestrian protection: Not just a question of compliance with crash-test regulations for Mercedes-Benz". media.daimler.com. Retrieved 11 July 2017. ^ Philips, T. (10 June 2008). "Mercedes-Benz Accident Study Shows 20 Percent Of Rear End Collisions Can Be Avoided With DISTRONIC PLUS and Brake Assist PLUS". www.emercedesbenz.com. Archived from the original on 24 September 2015. Retrieved 11 July 2017.